1991 Euro 560SEL continues to be a joy to own. Note that one of the two receptacles is empty. What (if anything) is on that circuit? And, if needed, what's the correctly rated fuse to insert? Most likely the blower motor, remove it with the key OFF & then see if the blower functions when you turn the key back on. ...that's not it. The car has the outboard 30A strip fuse protecting the blower circuit. (I nevertheless pulled the 25 Amp fuse from that external holder as advised, started engine, and blower motor still runs fine.) Mystery remains! I can obviously fiddle around until I figure this out by trial & error; but it would be really great if someone could offer up the definitive answer. How about the power rear seat or rear seat heaters? Turns out that external fuse IS for the heated seats after all. I incorrectly responded to pwogaman's earlier post based on the fact that I saw the indicators on the seat warmer switch light-up. I didn't sit around long enough to see if the coils actually heated. Indeed, with the fuse removed, the indicator lights on the switch still work, but no heated seats. Reinstall the fuse, and fannies are again warm! 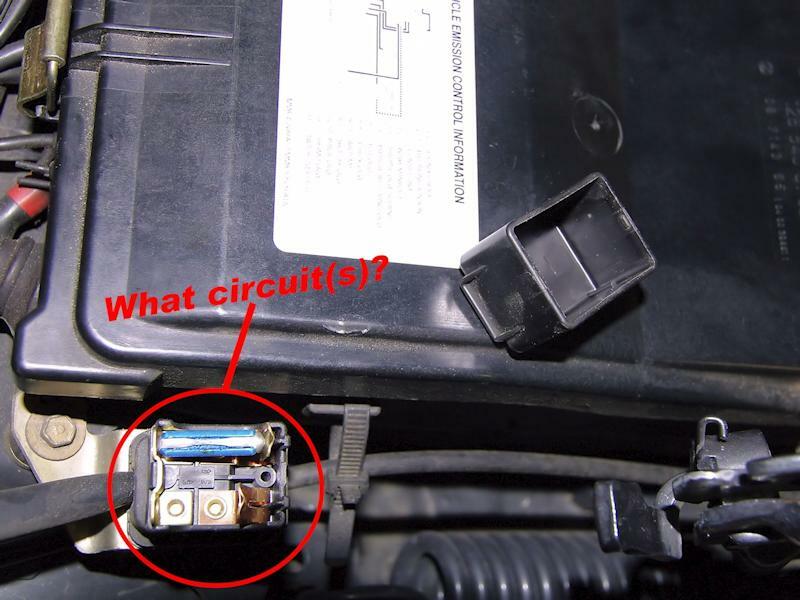 While the schematic shows that indeed there should only be a single fuse inserted in the dual module, it SHOULD be a 16 Amp fuse--NOT the 25 Amp one currently inserted in my car's receptacle. I'm making the switchover now to the correctly rated fuse. Thanks again for helping me to so easily resolve this one. GREAT!